What is Roof Fascia?Metal Roofing: What and Why? Heavy snow, wind, ice, hail and rain can impact your roof area and cause all sorts of damage come spring. That’s why it’s crucial to do a full spring roof inspection from top to bottom after the last frost. Below, in our spring roof maintenance guide, we’ll show you exactly what you need to do to check your roof for potential damage that could lead to bigger issues down the road. 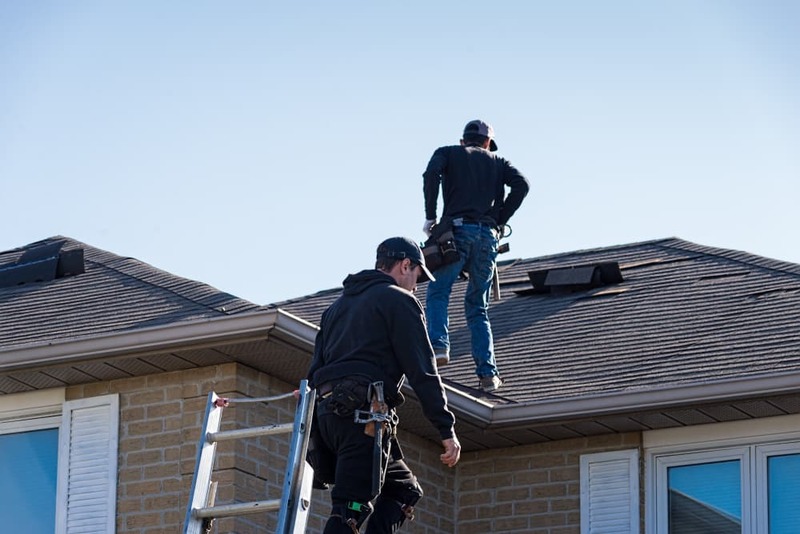 Before you pull out the ladder and inspect the top of the roof, take a walk around your home and look for any signs of damage that could be related to roof problems. For instance, do any of the gutters look out of place? Or is there obvious signs of water damage on the side of your home that could indicate a roof leak? Take note of any areas where you suspect an issue and then get ready to check it out from above. Head up onto your roof to give it a thorough look over. If you’re not comfortable standing on the roofing or if it’s very angular, then it’s best to stay on the ladder or hire someone do it for you. Look for any loose, warped, curled or missing shingles, damaged flashings, chimney issues, and holes. If there are any large branches that you can reach safely, you should pull those down and inspect underneath for any damage. And while you’re up there, it’s a good time to give your gutters a good cleaning. This involves removing any debris and power washing to clean out any debris and dirt buildup. If you’re not sure whether a particular area is leaking or damaged, your attic can help you determine this. Climb up into your attic and look for any areas that have water stains, mildew, wood rot or noticeable sagging. If you find anything, take note so that you can have a roofing professional come and inspect it. A professional should always be called in if you spot anything that’s of concern or needs to be repaired. Plus, it’s also wise to call a roofing expert to have the roof thoroughly inspected anyways. They know exactly what to look for and can identify areas that can be fixed now to prevent costly repairs in the future. It’s well worth the call. Giving your roof a thorough inspection every spring is the best preventative maintenance task that you can do. Just don’t forget to have your roof inspected twice a year, before and after winter. It’s the best way to extend the lifespan of your roof material and keep your home nice and dry. Call us today to set you up an appointment before the season ramps up!